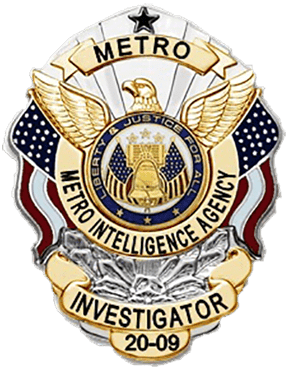 Metro Intelligence Agency is based in Denver but provides private investigators across Colorado and nationwide. Our databases and networking allows access to nationwide information from most government agencies and other proven resources more efficiently. In many cases information can be returned within twenty-four hours! We know investigative matters often involve highly charged, private situations and require discretion. We are sensitive to this and know how to minimize the stress in handling matters of a delicate nature. The databases that we use contain information not open to the general public. To obtain access every individual within the organization must meet rigid requirements, have a proven professional history within their area of expertise, and thorough background and employment history check to ensure the individual and the company are legitimate and possess only the highest level of integrity. We are subject to audit and onsite inspection through the GLBA, DPPA, FDPP, REBOC, UCC, FCRA regulatory agencies, as well as through the Social Security Administration and the Department of Homeland Security. So when you hear the term “public record” it is a very limited public record, accessible to under very strict guidelines. With the services we provide we can help you get to the information and answers you need to make informed decisions. We stand above the rest because of our experience, state recognized professional investigators, and conduct business with above standards of ethics and integrity. We have implemented a check and balances process to ensure that the information we provide is thorough, current, and accurate. Whether it’s a simple research request or a very complex investigation, you can be confident that we are second to none! Over the last few years, we have investigated several highly publicized cases and called by CBS to interview as a trusted and creditable investigative source.